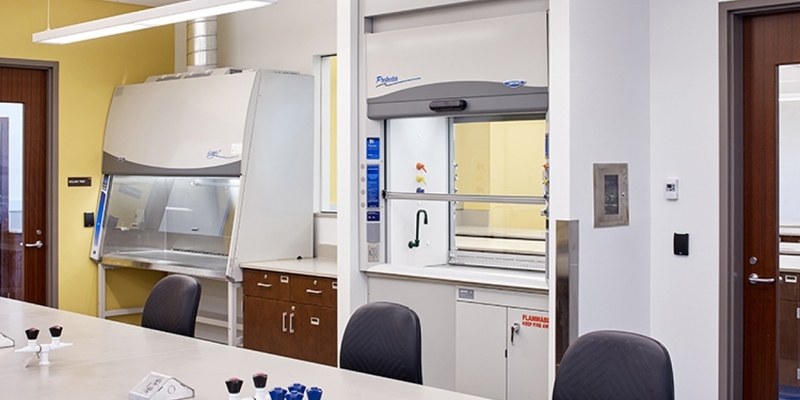 Here are some "do’s and don’ts" to follow when determining where in a room a Biological Safety Cabinet should be placed. Air supply diffusers or exhaust vents should not be placed directly over or in front of BSCs. BSCs should be located out of the laboratory personnel traffic pattern. Preferably they are placed at the end of an aisle. BSCs should not be placed near an entryway. If this cannot be avoided they should be placed at least 60” from behind the doorway or 40” from an adjacent door. Work Zone minimum dimensions include 40” in the front of the cabinet and 12” on each side. Clear Zones around the cabinet should include a minimum of 80” from opposing walls, 60” from opposing bench areas or occasional traffic areas and 40” between the BSC and bench tops along a perpendicular wall. In rooms with multiple BSCs, the BSCs should ideally be staggered. If this cannot be achieved, a minimum of 120” should be between two cabinets facing each other. If two BSCs are placed next to each other there should be a minimum of 40” between them. BSCs along perpendicular walls shall be placed 48” apart. Other details can be found in Appendix 1 of the National Institutes of Health Design Requirements Manual (DRM).